Taiwani handset maker, HTC has launched, its next generation dust proof and water-resistant Selfie smartphone, the all new HTC Desire Eye with Dual-13-MP Camera on Wednesday, 8th Oct. 2014 in Blue, Red, White colour option. Mumbai based online retailer Mahesh Telecom has confirmed that HTC Desire Eye is available in India Priced at Rs 35,990. How ever no confirmation from HTC so far about its pricing and release date in India. HTC Desire Eye is available in overseas market at $549. It will lock horn with Apple iPhone 6, iPhone 6 Plus and Samsung Galaxy S5. The all new HTC Desire Eye supports 4GLTE, NFC offers you bigger and brighter a 5.2 inches Full HD display with resolution (1080 x 1920 pixels) and 14M colour with HTC Sense 6 UI. New Desire Eye promising blazing multi-tasking with 2.3GHz quad-core Qualcomm Snapdragon 801 processor and Android 4.4.2 KitKat with Sense v6.0 UI. It also offers you 2GB RAM, 16GB internal memory with 128GB expandable memory which allows you store all your favourite Song, Video, Movies and Games. New HTC Desire Eye is the best smartphone for Photography with 13-MP primary Camera with Dual-LED flash and 13-MP front facing camera with Dual-LED Flash and HTC Zoe. New Desire never let you down due to 2400 mAh battery promising talk time: up to 26.8 hours(3G) and standby time up to 504 hours on(3G) measures 151.7 x 73.8 x 8.5 mm and weight 154 g offers connectivity via microUSB, Bluetooth 4.0 with aptX enabled, Wi-Fi, DLNA, GPS/AGPS + GLONASS, NFC and 4G LTE. New Desire Eye is a dust proof and water resistant smartphone( IPX7 certified Technology) allows your smartphone to survive up to 1 meter deep water for 30 minutes. This not enough new Desire Eye also combines next generation features like Front-facing stereo speakers powered by HTC Boomsound technology, HTC Blinkfeed, HTC Sense TV and Knock On gesture-control. Rivals Sony Xperia Z3, Samsung Galaxy S5 and Apple iPhone 6 and iPhone 6 Plus. 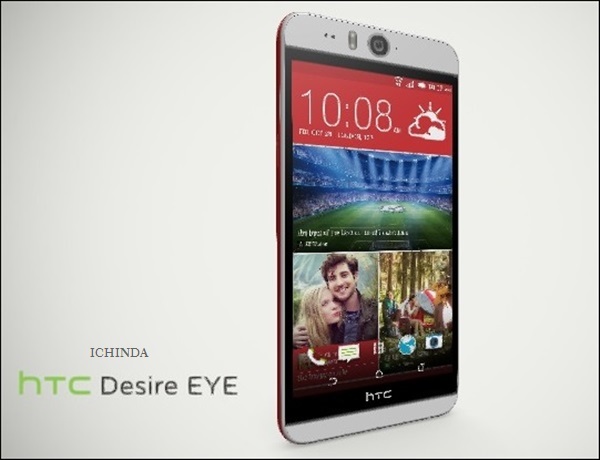 At last few Honest word, the all new HTC Desire Eye is coming to rule the hearts of smartphone lovers. What you think? Please be open to give your view.